Heat oven to 450°F. Spray 18x13-inch rimmed baking pan with cooking spray. In small bowl, mix dressing ingredients with whisk. Place potatoes in center of baking pan, and drizzle with 1 tablespoon of the oil; sprinkle with 1/2 teaspoon salt and 1/4 teaspoon pepper. Toss to coat. Spread in single layer in pan. Roast 30 minutes, turning once. In medium bowl, toss asparagus with remaining 1 tablespoon oil. Remove potatoes from oven, and arrange asparagus on baking pan with potatoes. Roast 5 to 7 minutes or until potatoes are lightly browned and asparagus is tender. Transfer roasted vegetables to serving bowl. Add dressing; toss to coat. Let stand 15 minutes to allow vegetables to absorb dressing. Add arugula; toss to combine. Serve immediately. Baby potatoes are typically 1 1/2 inches in diameter. If your potatoes are larger than that, you may want to quarter them. 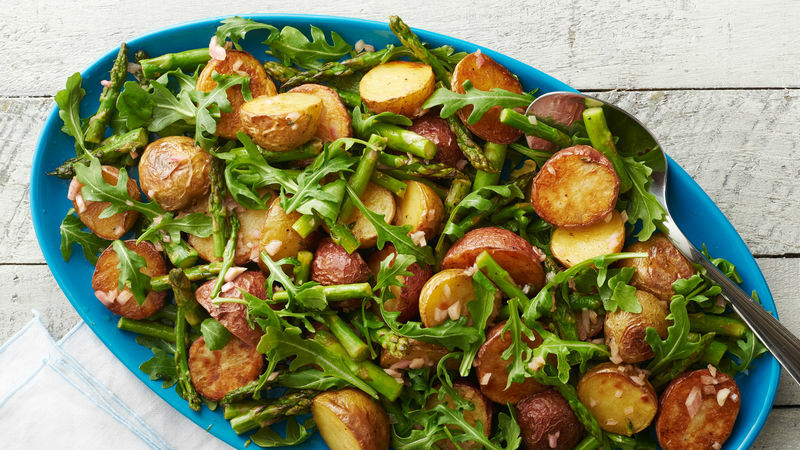 Baby arugula is a fairly sturdy lettuce, with a peppery flavor, that won’t wilt completely when combined with the slightly warm potatoes.